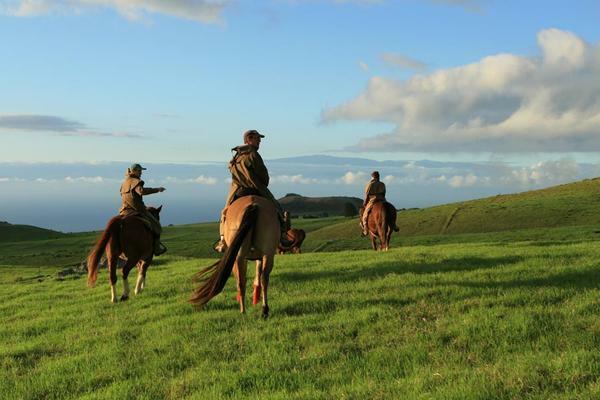 On horseback is the only way to enjoy the spectacular scenery of our 11,000 acre working cattle ranch which includes views of the ocean, the coastline down to Waikoloa, all the major volcanoes and Maui. Marvel at ancient Hawaiian ruins and see grazing cattle up close! 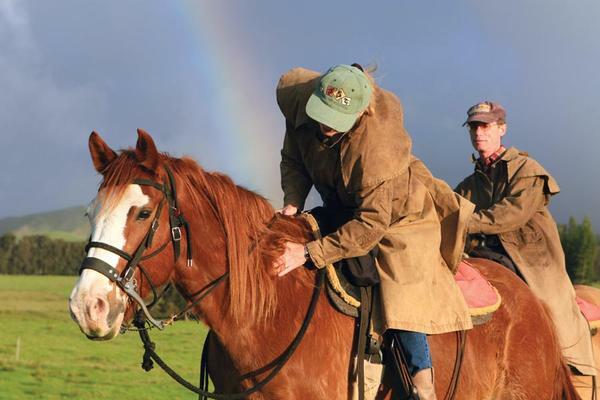 The Paniolo Ride includes trotting and cantering opportunities and all experience levels are welcome. Riders must be at least 8 years old. 8 and 9 year olds who have never been on an Open Range Ride must either take the City Slicker Ride or a Private Ride. Maximum weight is 230 lbs. Call for exceptions to weight limit. Six (6) or more riders requires 48 hour cancellation notice. Guests must sign a waver before riding. We provide free of charge: Boots, Light Jackets, Austrailian Duster Jackets, Chaps, Helmets, Hats, Bottled Water, Sun Screen. 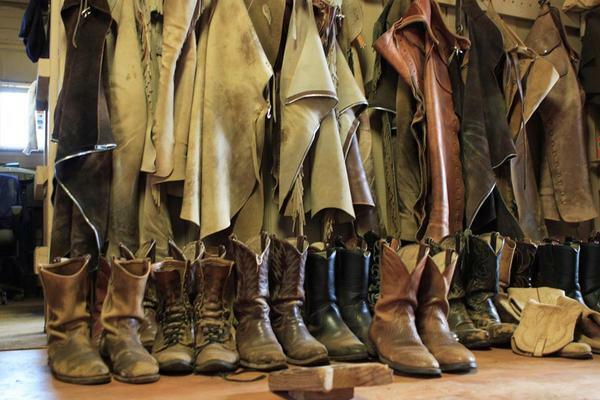 Boots, Light Jackets, Austrailian Duster Jackets, Chaps, Helmets, Hats, Bottled Water, Sun Screen. Long Pants and Closed Toe Shoes. Q Do you provide transportation to any area hotels? A If you are not renting a car we recommend asking your hotel about transportation. Q What do I need to bring? A Long pants and close toe shoes. Q Can I bring a camera or videocamera? A Yes if it can fit in the saddlebags that we provide with each horse. Q What does Paniolo Adventures provide? A Boots, chaps, hats, short jackets, Australian dusters, water, soda and sun screen are provided free of charge. Q Are your saddles English or Western? A We use Western style saddles. Q What happens if I exceed your 230 lb. weight limit? A Please contact us because we have some animals that can carry more weight. Q What if my 8 year old has never been on an open range ride? A 8 and 9 year olds who have never been on an open range ride must take a Private Ride. 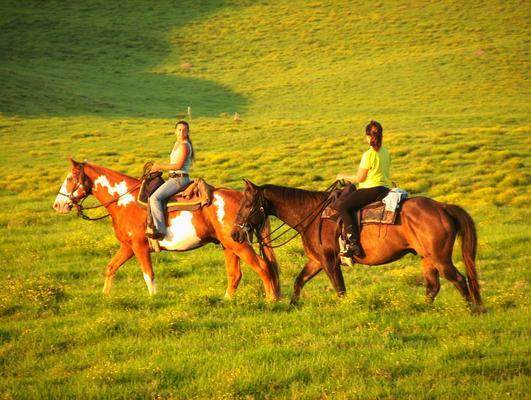 This is the safest way to introduce your child to an open range horseback ride. The Private Ride will include your child, a parent or guardian, anyone else in your party and one of our wranglers..
Q What happens if I decide to cancel the day of the ride? A You are charged the full ride price since we have a 24 hour cancellation policy. Q Can I ride with you even though I have never been horseback riding? A Absolutely. 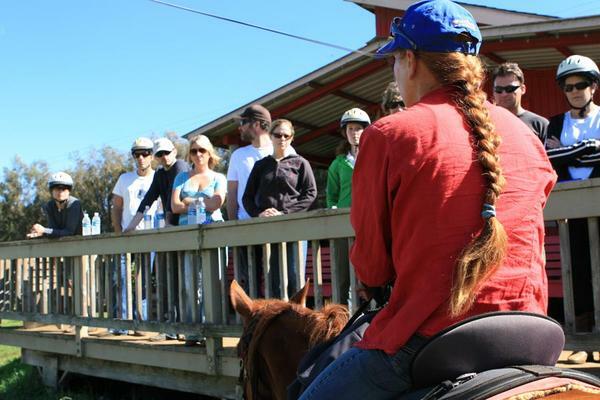 We have taken many first time riders and the majority of our riders are beginners. Our horses are very well trained and our wranglers are skilled. Q Can I trot and canter? 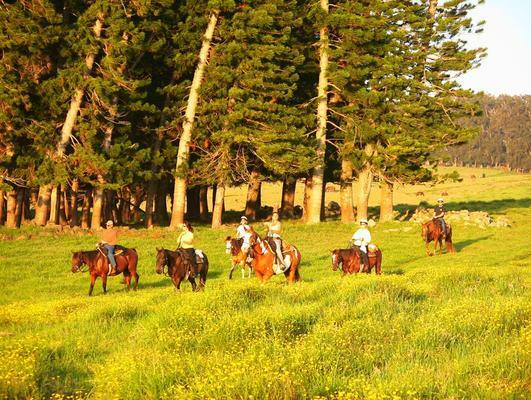 A We provide you with an OPEN RANGE horseback riding experience. We are not a “NOSE TO TAIL” riding operation. 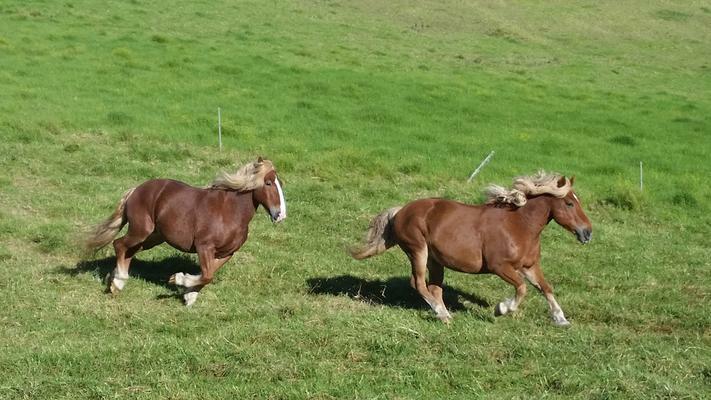 We take great care to match you with the right horse based on your height, weight and riding experience level. We encourage you to ride to your experience level. Q How many people go out on one of your rides? A We take a minimum of 2 and a maximum of 14 riders. The exact number varies seasonally and day to day. Q How many wranglers (guides) go out on the ride? A One wrangler for each 6 guests. Q What if I don’t want to ride with a large group? A We have Private and Custom rides where you and your party have your own wrangler. A private ride is a minimum of 2 people and you go out at our regularly scheduled times. On a Custom Ride you can go out anytime, anywhere on the ranch with your own wrangler. Q Can I choose to ride mauka (toward the mountain) or makai (toward the ocean)? A No. Your wrangler at check-in. decides whether you will ride mauka or makai. Weather and other factors determine the direction of your ride. Q What do we see on the ride? 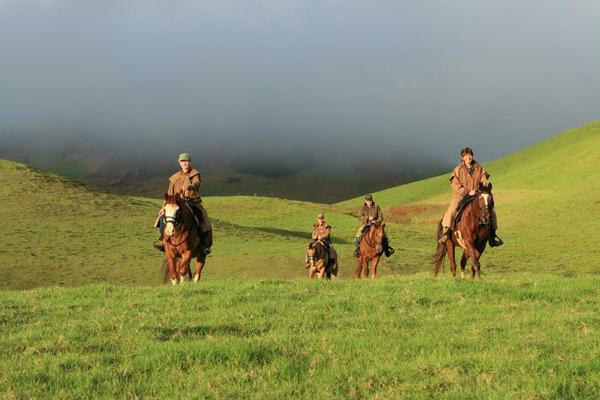 A The Ponoholo Ranch offers spectacular views of the Kohala and Kona coastline, the volcanoes, and the island of Maui. You will also see rolling green pastures and ancient Hawaiian ruins. Q Will we see cattle on the ranch? A Very likely. The 11,000 acre Ponoholo Ranch has the second largest herd of cattle on the island (6,000-8,000). Q What do you suggest for a rider who wants to spend a few hours in the saddle? A Our Wrangler Ride is designed for intermediate to advanced riders who want to get a good ride fix, “Not for beginners”. Q How many horses do you have? A We have 25 horses which take our guests out on rides. We also have several wrangler horses. Q What does Paniolo mean? 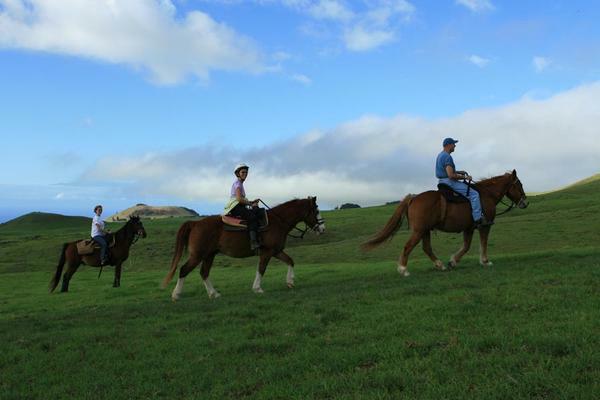 On horseback is the only way to enjoy the spectacular scenery of our 11,000 acre working cattle ranch which includes views of the ocean, the coastline down to Waikoloa, all the major volcanoes and Maui. Marvel at ancient Hawaiian ruins and see grazing cattle up close! Ride from 250ft. above sea level to 2500 ft. in elevation through the Big Island’s oldest Rainforest. 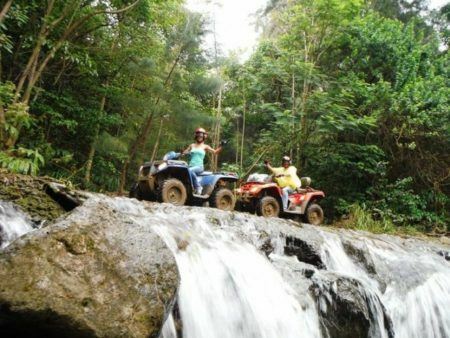 Ride under canopies of trees with scenic flora and fauna. This tour takes you to see two beautiful waterfalls. 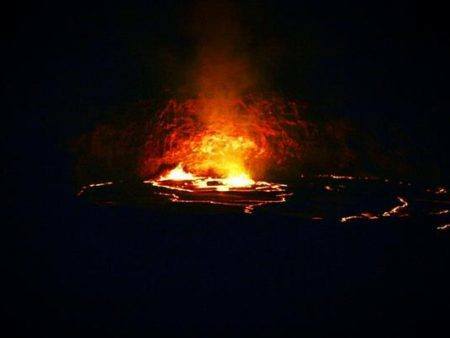 Make Kilauea Volcano and Hawai’i Volcanoes National Park your destination and stay past sunset! This is a fully narrated adventure starting at a world famous Kona coffee farm where a deli-style lunch is served. Steeped in tradition and history, Kalahuipua’a is known as a gathering place for Ali’i (royalty) and special visitors. 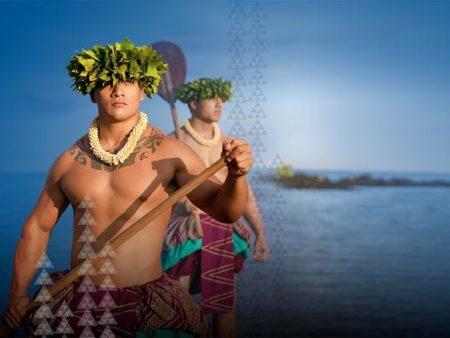 An evening at the Hawai’i Loa Lū’au is full of this same tradition of Hawaiian culture and hospitality.